I realize I’m crossing 300 with this without the usual special puzzle, but with Puzzle Marathon coming up, I’m sure everyone will have their fill of special puzzles. I’ll make it up later sometime between 300 and 400. Anyway, this was a 1 hour set at the Croatian competition. I basically started off with trying 1 classic puzzle and one variant of it, but then some pairings are just similar genres. For the variants, I’ll just put the additional rules. 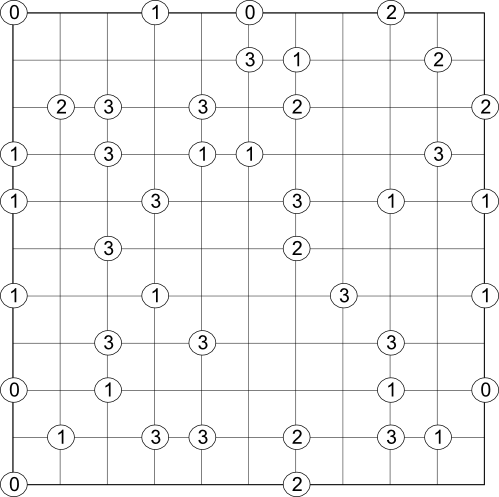 The Classic puzzles have links to their rules, and some are fully described here. The difficulties are obviously varied but barring the Pentomino I can’t immediately think of anything particularly difficult. 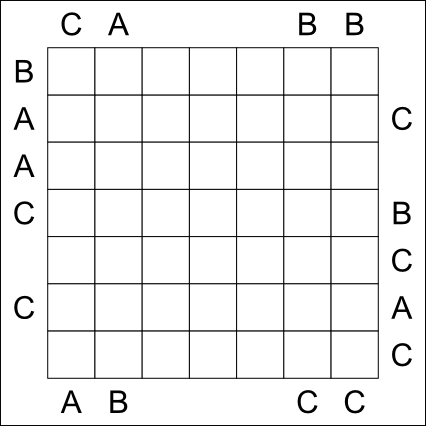 All puzzles tested by Bram De Laat. 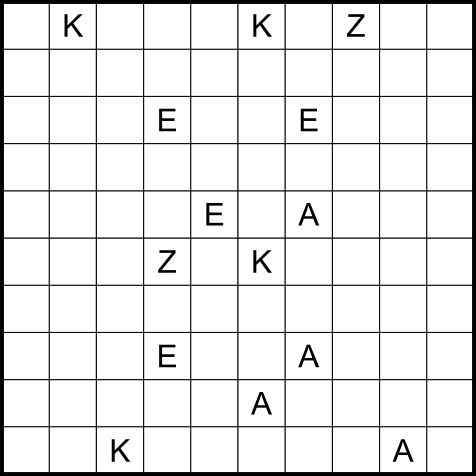 P298 : Bosnian Road Odd Even – The clues only give the information that the number in that clue cell is either Odd (O) or Even(E). All the clue substitutions are non-zero. 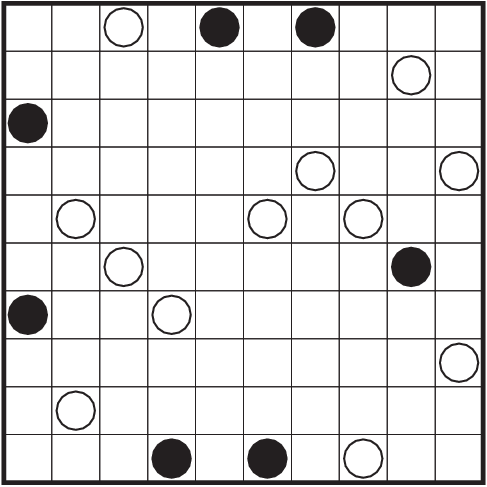 P300 : Corral Masyu – The cells not visited by the loop must be able to reach the edge of the grid by being orthogonally connected to other such cells. 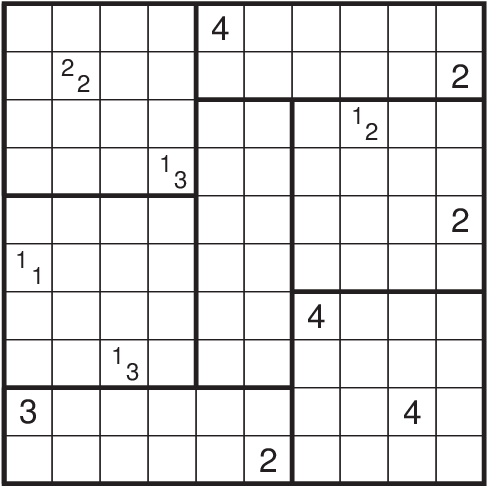 P301 : Hashi (Probably the easiest puzzle of the set) – Draw single or double straight lines between the circled numbers. 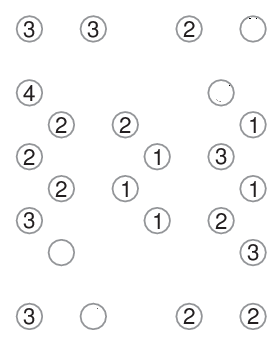 The number in a circle indicates how many lines must end there. 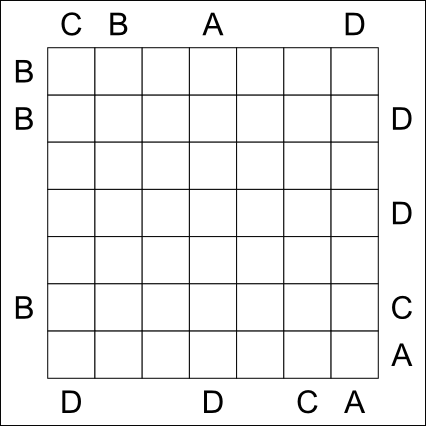 The lines must run horizontally or vertically and must not cross or branch off. All circles must be connected to each other; i.e. 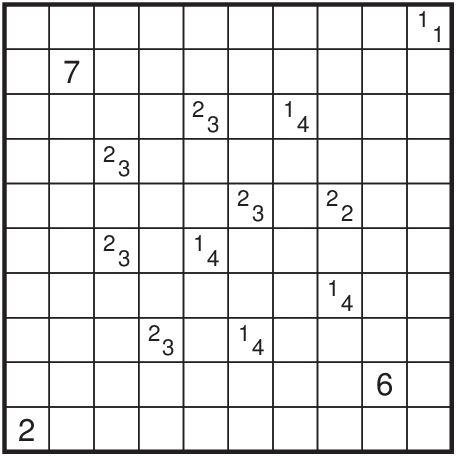 it must be possible to travel from any circle to any other circle following the lines..
P302 : Gokigen naname (Known as Slalom in some places like Croco Puzzle) – Draw exactly one diagonal line in each cell of the diagram. 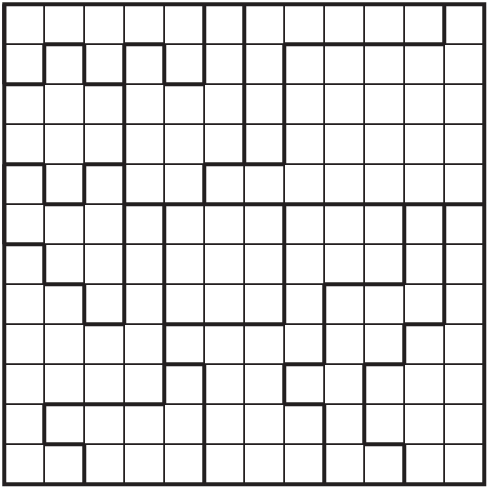 A number in some intersections of the grid lines denote how many diagonal lines end in this intersection. The diagonal lines must not form a closed loop. P304 : Trio Cut – Paint some cells to make some triminos so that each trimino will be cut twice by thick lines. Each region bordered by thick lines should have 3 painted cells. 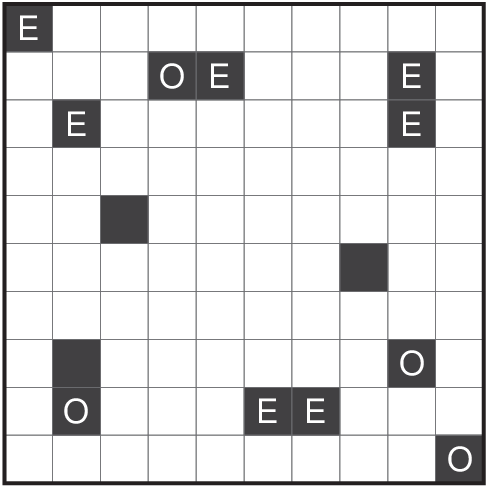 P306 : Easy as ABC Untouch – Additionally, same letters cannot touch each other even diagonally. Range is A-D.
P308 : Cipher Nurikabe – The numbers are replaced by letters. All instances of the same letter have same values and different letters have different values. Note that the rule says values, so one letter can stand for a multi-digit number too. 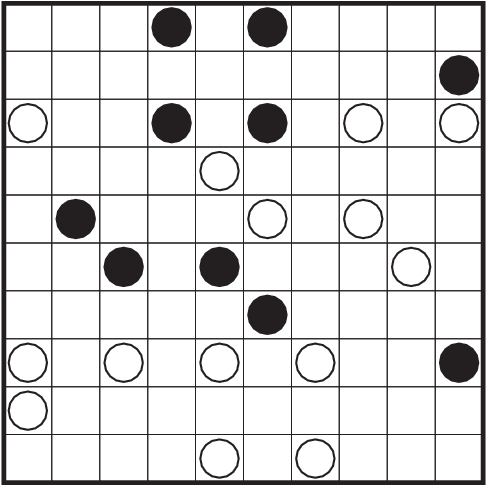 P310 : Disjoint Groups Tapa – Additionally, clues in the same box cannot have the same position around them shaded. E.g. 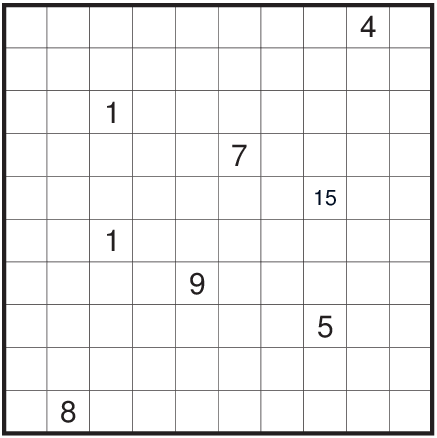 2 clues in the same box cannot both have the cell directly above them shaded. 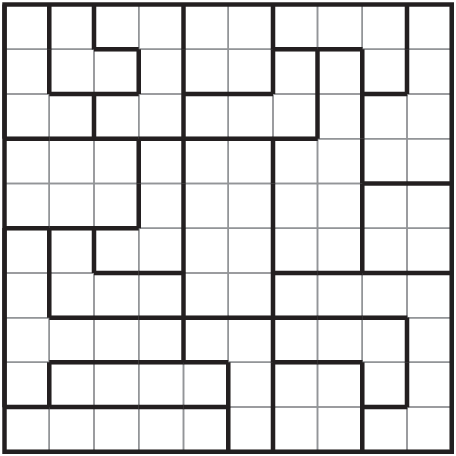 P311 : Pentomino – Place the 12 Pentomino pieces into the grid. They can be rotated and reflected. They cannot be placed in black cells. 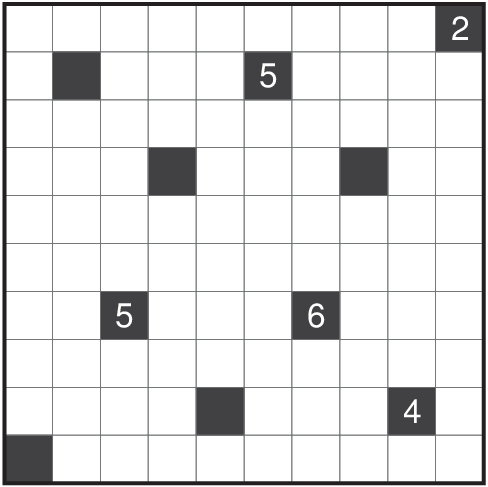 Two pieces cannot touch each other even diagonally. 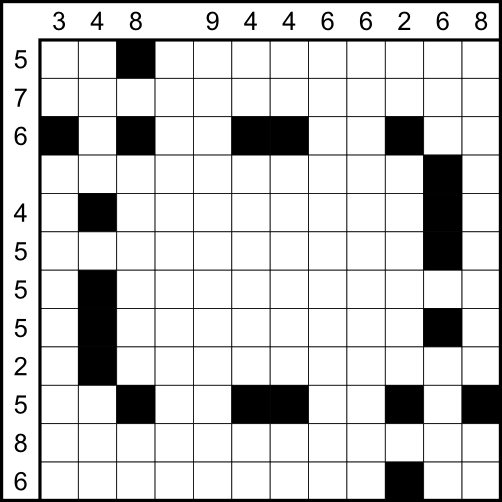 The numbers outside give the number of cells occupied by pentomino pieces in that row or column. Pentominos given at the end of the post. 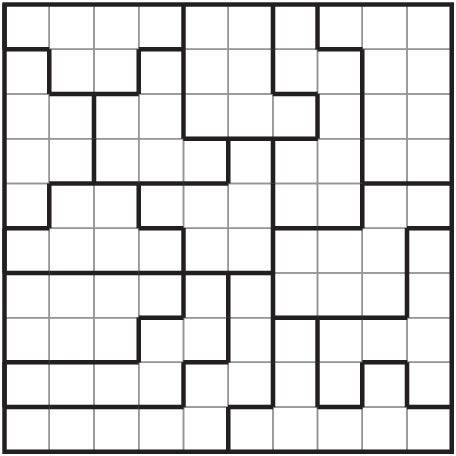 P312 : Pentomino Areas – Instead of the numbers outside, the grid is divided into regions, each of which consists of exactly one entire pentomino.